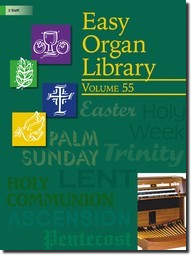 Reprinted from past issues of our long-running magazine, "The Organist", this handy wire-bound book of almost one hundred pages of accessible music would be a welcome addition to any organist’s library. Novice players will appreciate the uncomplicated pedal parts, while veteran organists will enjoy the convenient "pick-up-and-play" aspect. Registrations and durations for all titles are provided, as are suggested uses for the worship service.